This book recovers places appearing in the mental mapping of medieval and Renaissance writers, from Chaucer to Aphra Behn. 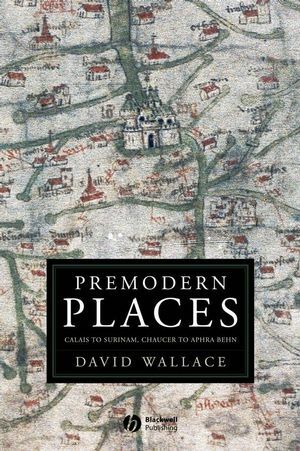 A highly original work, which recovers the places that figure powerfully in premodern imagining. Recreates places that appear in the works of Langland, Chaucer, Dante, Petrarch, Spenser, Shakespeare, Aphra Behn, and many others. Begins with Calais – peopled by the English from 1347 to 1558 and ends with Surinam – traded for Manhattan by the English in 1667. Other particular locations discussed include Flanders, Somerset, Genoa, and the Fortunate Islands (Canary Islands). Includes fascinating anecdotes, such as the story of an English merchant learning love songs in Calais. Provides insights into major historical narratives, such as race and slavery in Renaissance Europe. Crosses the traditional divide between the medieval and Renaissance periods. David Wallace is Judith Rodin Professor of English at the University of Pennsylvania and Life Member of Clare Hall, Cambridge. He has traveled extensively, exploring the importance of place both for print and documentary radio. 5. Canaries (The Fortunate Islands). A highly and engaging work by one of the world's most renowned medievalists. Recreates and connects the places that appear in the works of Langland, Chaucer, Dante, Petrarch, Spenser, Shakespeare, Aphra Behn, and many others. Explores the distinctive cultural life of a range of locations, among them Calais, Flanders, Somerset, Genoa, the Fortunate Islands (Canary Islands), and Manhattan. Featuring fascinating vignettes, such as the story of an English merchant learning love songs in Calais.